Snake Eyes Mini is a downsized version of Blizzard’s larger Snake Eyes moving head. The Snake Eyes Mini is equipped with 6 CREE® 10W RGBW LEDs, each with a 9° beam angle. 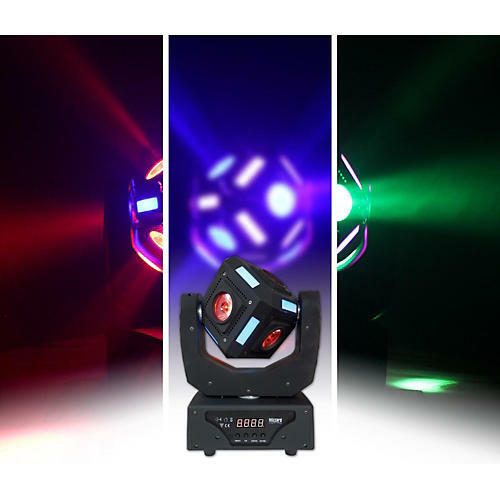 A bonus of 12 RGB strips beautifully highlight each edge of the head, and can perform color chases in auto mode or be controlled via DMX with a separate dedicated strip chase speed control channel. Aerial effects from Snake Eyes Mini moving head fixtures are crisp and bright with RGBW mixed colored beams coming from any or all directions with user-selectable 630°/540° pan and infinite tilt. Snake EyesTM Mini has two user-selectable DMX modes (14/16-channels) that allow ease and flexibility in programming, as does its easy-to-use 4-button LED control panel. Power connection is via industry standard PowerCon® compatible In/Out jacks, and DMX 3-pin In/Out jacks + a single quarter-turn “Omega” quick connect type clamp bracket round out the pro feature set.